Niconoise, a son of Redoute’s Choice, is the half-brother of Widden Stud’s successful dual Group 1 winning sire Nicconi (Bianconi) as well as the three-quarter brother of multiple Group 1 winning Niconero (Danzero). They are all out of the Devitt and Gordon families’ star broodmare Nicola Lass. 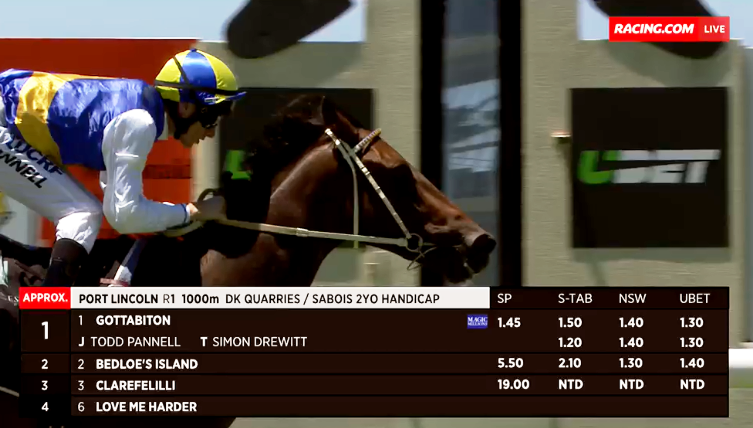 The first crop sire has had just the one runner so far, the Simon Drewitt trained Gottabiton, and it was that youngster who duly saluted over 1000 metres at Port Lincoln. The 2YO, ridden by Todd Pannell, sat on the shoulder of the leader throughout much of the race before lengthening stride at the top of the straight and extending for an easy win. The Ponderosa Park bred juvenile had raced just once previously, in a city class race at Gawler at which he was more than competitive behind the talented Chicago Typewriter. – was the post race comment by trainer Simon Drewitt who bought him from Ponderosa Park at the 2017 Magic Millions Adelaide Yearling Sale. Ponderosa Park’s Paul Kelly was absolutely thrilled, albeit a little surprised by the win for his stallion. “We didn’t expect many to be starting as two-year-olds so to get an early winner is great,” Kelly said. “He raced at Gawler without a trial and ran a good race. Niconoise won four city races from 1100 metres to 1800 metres and currently holds the Flemington 1700 metre Track record. He ran in the Australian Cup the race after breaking this track record, however he suffered a serious leg injury and was subsequently retired. Notably none of Niconoise, Niconero or Nicconi won as early two-year-olds with only Nicconi scoring as a later season juvenile (in April of his 2YO racing season). All were trained out of Lindsay Park. Another sibling of the ‘Nicos’ is the stakes placed Holly Go Lightly. She now calls Ponderosa Park home and is in foal to Spendthrift Farm sire Jimmy Creed. The Nathalia (north east Victoria) based Niconoise had seventeen live foals out of his first crop mostly bred by smaller, local breeders who Kelly expects to be very patient with the progeny. The sire covered thirteen mares in the 2017 breeding season, a number sure to be bigger in 2018 should there be more youngsters like Gottabiton seen at the tracks.